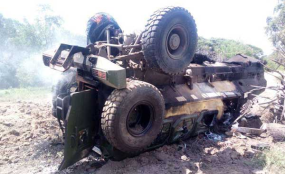 An armoured personnel carrier that ran over an explosive planted by suspected Al-Shabaab militants in Lamu County on May 31, 2017, killing seven policemen and a civilian. 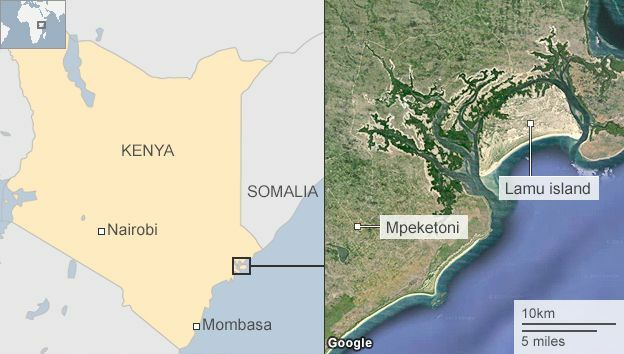 Nine security officers and a civilian died on Wednesday after their vehicles ran over explosive devices in separate terror incidents in Lamu County. The first explosion happened at 8.30am, between Baure and Milimani, killing all seven police officers on board an armoured personnel carrier and the civilian passenger. The officers from the Rural Border Patrol Unit of the Administration Police were travelling on the Kiunga-Hindi Road. Military reinforcements were immediately dispatched and were moving to the scene when another explosive went off along their way, killing two Kenya Defence Forces soldiers and injuring another. Yet another explosive device went off between Kiunga and Ishakani later at 3pm. Initial investigations shows the third explosion was aimed at a military lorry but it went off just before the vehicle arrived at the spot. Military personnel on board escaped and managed to reach their destination. The incidents are similar to others in neighbouring Garissa County and Mandera, where 20 people including 11 police officers have died in explosions since May 12. Head of the multi-agency Operation Linda Boni James ole Sereini confirmed the first explosion, saying it happened on Kiunga-Hindi Road. "At about 8.30am there was a security incident between Baure and Milimani. A police vehicle ran over an IED. Several officers were injured. We have sent KDF and police reinforcement to the area to pursue the attackers. We will provide more information once we get full details of the incidents," he said. The military response team was from the Baure military camp, which was attacked by Al-Shabaab in 2015. The officers from the patrol unit camp in Mangai were heading to Mokowe for refuelling when the attack happened. Police sources on the ground said KDF soldiers from the Baure military camp responded immediately but they were also attacked on the way to the scene by the militants. The region has been labelled an operational area, meaning it has remained under intense security activities since the government launched Operation Linda Boni on September, 15, 2015. 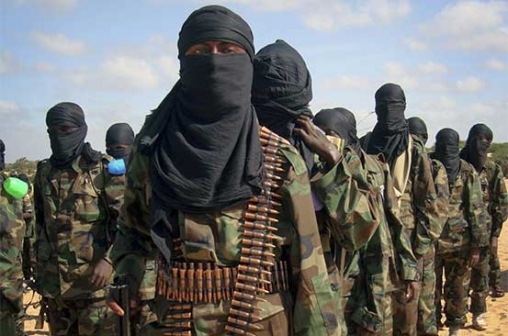 The operation covers the counties bordering Somalia and was initially concentrated in Boni Forest to root out Jeshi Ayman, the local faction of Al-Shabaab that had set up camps in the area. The operation is aimed at annihilating the Al-Shabaab terrorists.